Whether you are a reenactor or simply want to dress up at Halloween, Colonial costume patterns are easy to come by. These costumes are also surprisingly easy to create and can often be completed in a weekend. Simplicity, Vogue, McCall's and Butterick (pattern purveyors) all make Colonial outfit patterns. Start by looking for the pattern numbers in pattern books by flipping to the "Historical" or "Halloween Costume" sections. Undoubtedly you'll find more than a few patterns for skirts, tops, jumpers, mobcaps and more. Once you decide upon a pattern, be sure to read the sizing charts on the back of the package. You may find that a size you commonly buy in the store is not the same when it comes to pattern sizes -- they're often smaller. The pattern package will also list accessories or additional decorative items you may want for your individual costume. Patterns of Time offers plenty of patterns for the Colonial period for men, women and children. Riding outfits, sailor slops and frock coats are but a few of the many patterns offered here. They also sell hardware that may be needed for your Colonial costume such as suspender hooks, belt buckles and unique buttons. Ageless Patterns features a selection of men and women's colonial-era patterns including broadfall pants, trailblazer shirts, empire dresses and stays of just about every size. Kannik's Korner: Selling everything that you would need for a Colonial costume (including the costumes themselves), this online store also sells books on this time period and cross-stitch kits. Amazon Dry Goods: One of the most familiar online pattern resources for re-enactors of every time period. This merchant sells quality patterns printed on heavy, semi-transparent paper. They have dozens of patterns to choose from and most have easy to follow instructions, even for the novice seamstress. Many people often forget that they can copy or borrow the patterns they need for a costume. There are local and online sources for borrowing and copying historical patterns.Locally, contact your historical society or if you are lucky, a colonial reenactor's guild. These two places often have patterns that they will lend you to copy, or loan to you for free. Try checking with the drama department at the local high school or a local college's theater department to see if you may borrow any of their patterns. Online, you can find patterns to borrow from the Vintage Pattern Lending Library. They require that you become a member before they will loan you the first pattern. Yearly membership costs vary from $25 to $110. The level of your membership determines the number of patterns you may take out, from two to 10 patterns each year. 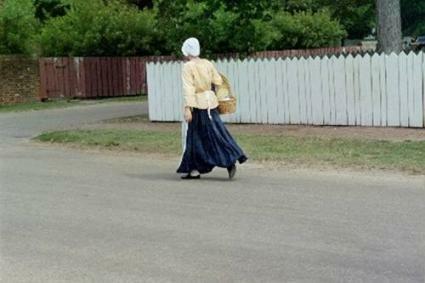 Colonial Williamsburg is one of the best places to see quality Colonial costumes. Their website offers a plethora of historical information on the time period and a special section on the Colonial Costume Design Center.